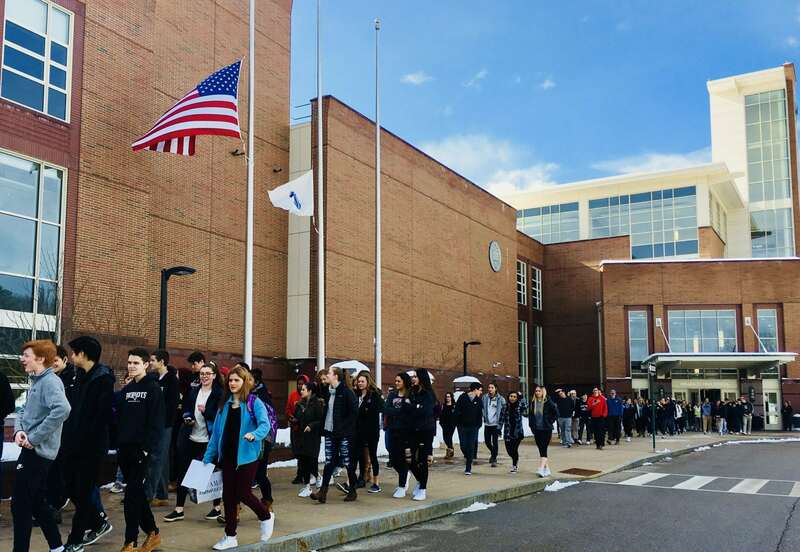 Wellesley High School students today congregated in the school parking lot for 17 minutes to observe a moment of silence and deliver speeches. The student-run event was put together as a way to honor the 17 who died and the many who were injured last month at the Parkland, Florida school shooting and to demand that politicians and others take action against gun violence. Schools throughout the United States participated in similar ways, most yesterday as planned on a national scale, some today due to the nor’easter that cancelled classes for many districts in the northeast. Students filed out of class for a 17-minute demonstration to honor those killed and injured in Parkland, Florida. At 10am, the students filed out of the WHS front doors, some holding signs that said, “Save Lives, Not Gun,” “Fear Has No Place in Schools,” and “We Will Be Heard,” among other sentiments. The peaceful demonstrators walked to the largest area not covered by about a foot of snow — the road that bisects the two halves of the lot — their numbers stretching almost out to Rice St. There were high fives and hugs as they spilled out the doors and just kept coming. State Representative Alice Peisch was on hand to observe, but left the speechifying to the students today. 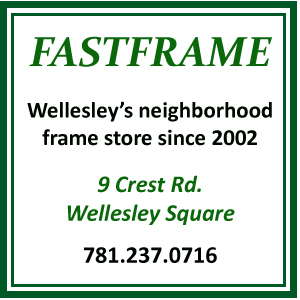 Wellesley police were also at the high school, at the perimeter of the demonstration. After the speakers had finished, and the students went back to classes, one young man remained behind, holding a “Save Lives, Not Guns” sign. Gunnar Green didn’t join his peers as they headed back into the nice, warm building. “I felt like 17 minutes wasn’t enough, so I decided to stay out,” he said. “It felt to me that the faculty was too involved and we were actually learning to obey them rather than participate in an authentic protest.” He admitted to being a little cold out there, but his determination to rabble rouse in his own way overrode a little temporary discomfort. WHS student Gunnar Green stayed outside to continue demonstrating, long after his peers headed back into the school. “I felt like 17 minutes wasn’t enough,” he said. 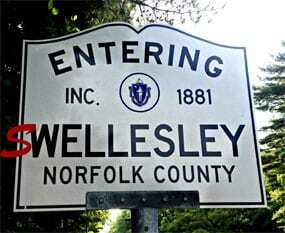 These are Wellesley youth, and they are rising up. Either help them, or get out of their way. I wonder what you would have argued in the civil rights era or the slavery era. Also, you assume that these kids kids were coerced. Being closer to my teenage years than you probably are, I can remember protesting the Iraq war and really meaning it – without adult influence. It’s incredibly obnoxious of you to claim these kids were somehow convinced by adults to do this. The world is changing … and it will change with or without you. Knowing that Martin Luther King applied for a pistol permit yet was denied, I know where my arguments would stand during that era. Also, it was Charlton Heston, a past president of the NRA, who marched in support of MLK long before it was the fashionable thing to do. Also, after the civil war, it was Frederick Douglass who urged the federal government to prevent any infringement on the right to keep and bear arms. If only they taught these historical points in school nowadays these kids (and you) might not be so easily manipulated for political gain. During those eras you mentioned, I would be against the prevailing gun control movement. Now I ask you, what you would have argued during the civil rights or the slavery era? If you support the contemporary gun control anti-civil rights movement, it sure sounds like you’d be squarely against the sentiments of MLK and Frederick Douglass. If you support this WHS rally, then you want to disarm law abiding people who merely want to be responsible for their own safety. You might say, “That’s what the police are for”. Sorry, the police have no duty to protect an individual person. This has been reaffirmed by several court cases: Warren v. D.C. and Gonzales v. Castle Rock, etc. These little rallies will be forgotten and the natural right to keep and bear arms will live forever. The right to bear arms was first proclaimed by Henry II in 1181 which assured every free man the right to keep and bear arms. This natural right is here to stay. P.S. Do you realize that gun ownership is a civil right? That’s what I was referring to as a civil right in my initial post. Sorry if you missed that. Were any school resources used to push this anti-civil rights political agenda? I see Alice Peisch, Principal Jamie Chisum, and Superintendent David Lussier were in attendance. I believe you are using my tax revenue for political gain and purposes. This strikes me as the very essence of civil rights. And the students provided the ladder and sound system, so you can rest easy about your tax dollars providing the resources. This was an anti-2A politically charged event (yes, gun ownership is a civil right) under the guise of “enough”. This event used public funds, was facilitated by school staff, and involved coercing children under the care of that school staff. Why do you think Alice Peisch attended? She attended for political gain. Despicable. Hey Dan! The fact of the matter is that the students did this all by themselves, without the faculty’s assistance. There were no public funds used in this movement, just some good old fashioned donations by students who believed in the message. If you really think we were coming for you and your guns, why don’t you actually listen to what the kids were saying? They just want to feel safe in the schools. This was a a first amendment politically charged event (yes, free speech is a civil right). You’re missing the root cause of the Florida tragedy. About 30 state / federal agencies failed to act on multiple red flags indicated by a troubled youngster. This systemic failure coupled with a soft-on-crime mentality is what enabled the tragedy to occur. The civil rights of all should not be curtailed as a result of this troubled youth.